Grid parity refers to the point at which solar PV-generated electricity fed to the grid is at least as cheap as electricity from fossil fuels. The term grid parity in the solar industry expresses to the point at which solar photovoltaic-generated electricity fed to the power grid is at least as cheap as electricity generated by burning fossil fuel sources. In view of the current trend of decreasing PV module prices, this has been predicted to occur globally in the near future. If referring to grid parity in common speech, it usually points to gross grid parity. 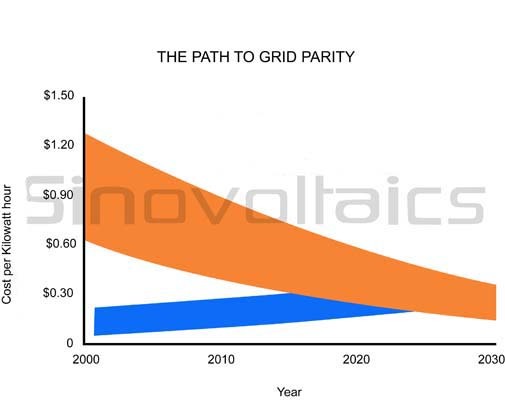 In the narrow sense, real and thus net grid parity is only reached if solar photovoltaic-generated electricity can replace other sources anytime, which is and can only hardly be the case since PV power is only available when there is sufficient sunlight. Actually, net grid parity goes hand in hand with pure off-grid solar conditions, thus a situation in which there is no alternative source of power. This situation requires – according to the average power demand – more PV modules to generate overcapacities of electricity to be stored for non-sunshine situations and consequently additional large battery capacities, eventually also inverters, charge controllers as well as mounting structures. All theses additionally necessary components incur higher costs of the whole PV system. Moreover, due to its complexity, maintenance costs need to be calculated, too. Hence, from the perspective of an end user, net grid parity can only be achieved if the fix costs plus maintenance costs of this whole PV system for a quantity X kWh of produced power during the system’s lifetime T amount at least to the total cost of purchasing X kWh over T from a electric power company. Grid parity in the solar industry is considered to be the point when solar panels will seriously start taking market share from fossil fuels, and has the chance to become the dominant form of energy. We can only speak of grid parity when solar energy is generated without subsidies or government support. if the price of solar energy keeps dropping like it did the past 3 years, in many countries grid parity will be reached within now and a decade. to read all this valuable PV content at one single place.